Robert De Niro was back on Saturday Night Live playing the role of Robert Mueller once again. The 75-year-old Trump hater was the opening act sitting behind a desk as he read a pack of lies. 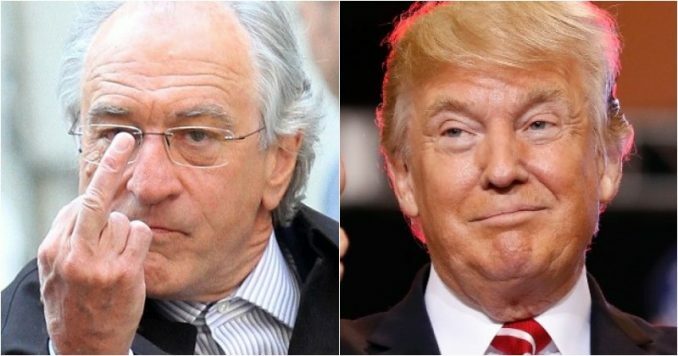 De Niro claimed there is Russian collusion by the president but Attorney General Bill Barr is covering it up. Well, poor Bobby instantly got destroyed. Don’t miss this. “Left-wing Hollywood director Rob Reiner has thrown in with those who believe U.S. Attorney General William Barr is attempting to ‘gaslight’ the American people after releasing the summary of the Mueller report, which concluded that President Donald Trump’s 2016 presidential campaign did not ‘collude’ with Russia,” Breitbart reported. Those sentiments were basically all De Niro had as he played Mueller. In the skit, Mueller (De Niro) read from his report while Barr (comedian Aidy Bryant) buffed it to exonerate the president, and Trump (Alec Baldwin) spun it all. “I am submitting these 380 pages,” said Mueller (De Niro). De Niro made sure his Mueller made it clear there is Russian collusion and insisted that is what is in his final report. If Saturday Night Live was hoping to appease their leftwing audience, they were wrong. The entire almost 5-minute skit was a stinker with only a few laughs. It was truly pathetic. This is all De Niro is good for anymore. He’s a washed up actor who just came seem to separate make-believe from real-life. “I truly don’t care what DeNiro does as long as I don’t have to see him. In anything. Ever,” tweeted Twitter user Sharon Chang. And Ms. Chang reflected over 5,000 responses with Americans sick and tired of De Niro’s hypocrisy. Which brings us to President Donald Trump’s secret weapon which is trouncing the Hollywood crowd. I truly don't care what DeNiro does as long as I don't have to see him. In anything. Ever. The leftwing losers were in for really bad news. Approximately 34% of attendees at President Trump’s Thursday night rally in Grand Rapids, Michigan were registered Democrats, according to Trump’s 2020 campaign manager Brad Parscale, who is the Commander in Chief’s secret weapon. That means in the war for swing votes in 2020, the Democrats are losing big time. The Hollywood crowds influence is supposed to be the Democrats go-to strategy to keep their base from roaming over to the GOP. Saturday Night Live is one of those shows which the Democrats count on to keep their voters from straying. But De Niro and his cohorts are failing. “Speaking on Saturday with Fox News‘ Jesse Watters, Parscale explained that the campaign uses the phone numbers of attendees to look up their voter information,” Zerohedge reported. Trump may not have the Hollywood crowd to help him target voters, but he has a marketing genius in Brad Parscale, someone Bobby De Niro has never heard of, but who is beating SNL and their cohorts hands-down. The days of the celebrity class influencing elections are over. Trump has claimed victory over the Hollywood crowd, and De Niro will be remembered as a nutjob who ended his career spewing conspiracy theories on Saturday Night Live.